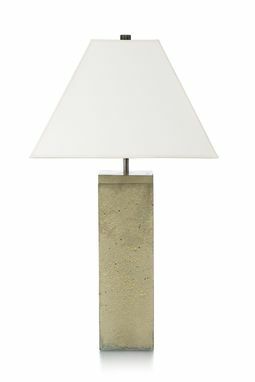 This concrete table lamp suggests strength inherent in the material itself. Its simple unassuming form is minimalist in style and rich in natural organic texture. The smooth outer surface implies a rough tactile sensation that invites the user to get close and feel the sensory pleasure of a touch. This modern contemporary table lamp is stunning in clean modern environments and equally at home in urban lofts, rustic modern and arts and crafts interiors. A stable and sturdy lamp, it is topped with a heavyweight paper shade and is signed and dated on the bottom. An insignia of a small weathered washer is embedded into each piece.